Product information "HI7698194 MULTI-PARAMETER PROBE (pH, ORP, EC, DO), for HI 98194 portable meter, with a 4m cable"
The HI7698194 is a multiparameter pH/EC/DO/Temperature probe for use with the HI98194 portable meter. It features a quick connect that makes a waterproof connection with the meter. Sensors are automatically recognized by the probe and meter when connected. Sensor replacement is quick and easy with field replaceable, screw type connectors that are color coded for easy sensor identification. The probe features a multistrand-multiconductor shielded cable with 4m, 10m, 20m, and 40m lengths available. It’s rugged, waterproof design makes it ideal for field use. 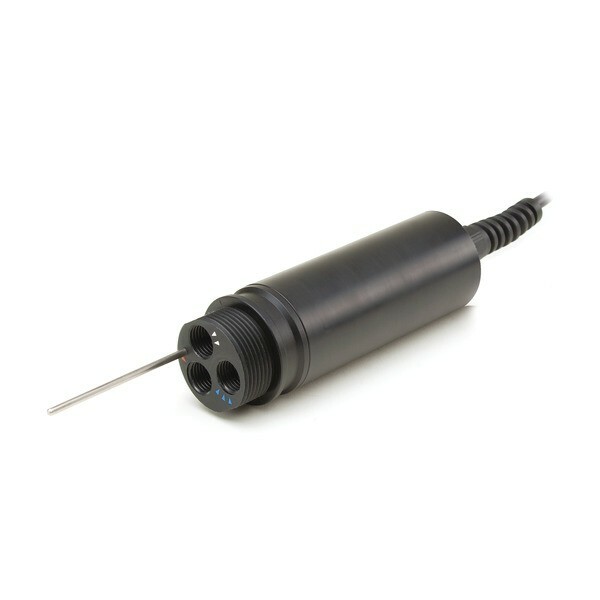 Waterproof Protection - The HI7698194 probe features an IP68 rating for continuous immersion in water. Quick Connect Digital Probe - The HI7698194 probe features a Quick Connect DIN connector that makes a waterproof connection with the meter. Color Coded, Field Replaceable Sensors - Sensor replacement is quick and easy with field replaceable, screw type connectors that are color coded for easy sensor port identification. Auto-sensor Recognition - The probe and meter automatically recognize the sensors that are connected. Any ports not used on the probe will not have the parameter displayed or be configurable. Automatic temperature compensation – Integrated temperature sensor allows for automatic temperature compensation of pH, conductivity, and dissolved oxygen measurements. The HI7698194-0 is a replaceable pH sensor for use with Hanna’s family of mulitparameter portable meters and probes. The sensor body is constructed of durable PEI material and contains a double ceramic junction design. The HI7698194-0 contains a glass pH sensing tip combined with a Ag/AgCl reference electrode in gel electrolyte. Each module is color coded for easy installation and integration with the probe. The HI7698194-1 is a replaceable pH/ORP sensor for use with Hanna’s family of mulitparameter portable meters and probes. The sensor body is constructed of durable PEI material and contains a double ceramic junction design. The HI7698194-1 contains a glass pH sensing tip with a platinum ORP sensing pin. Each module is color coded for easy installation and integration with the probe. The HI7698194-3 is a replaceable 4 ring electrode conductivity sensor for use with Hanna’s family of mulitparameter portable meters and probes. The sensor body is constructed of durable ABS material and contains AISI 316 stainless steel electrodes that are not subject to polarization or surface coating effects. Each module is color coded for easy installation and integration with the probe. The HI7698194-2 is a replaceable galvanic dissolved oxygen membrane sensor for use with Hanna’s family of mulitparameter portable meters and probes. The sensor body is constructed of durable ABS material and contains an easily replaceable membrane cap design. The membranes are constructed of HDPE and each cap screws onto the sensor with the twist of a finger. The HI7698194-2 sensor contains a silver cathode and zinc anode. The sensor module is color coded for easy installation and integration with the probe. Related links to "HI7698194 MULTI-PARAMETER PROBE (pH, ORP, EC, DO), for HI 98194 portable meter, with a 4m cable"
Customer evaluation for "HI7698194 MULTI-PARAMETER PROBE (pH, ORP, EC, DO), for HI 98194 portable meter, with a 4m cable"